At Mailbird we are preparing everything for the big Windows 10 launch next Wednesday, July 29th. Mailbird will launch on Windows 10 with some great improvements that we will share with you in our next post, coming next week. Now leading up to the launch, we have a great promotion running to celebrate the upcoming launch with you. “How?” You might be asking. Simply go to our Windows 10 sign up page here. 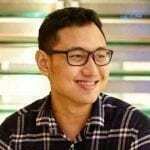 Fill in your email and wait for the great day July, 29th to come. 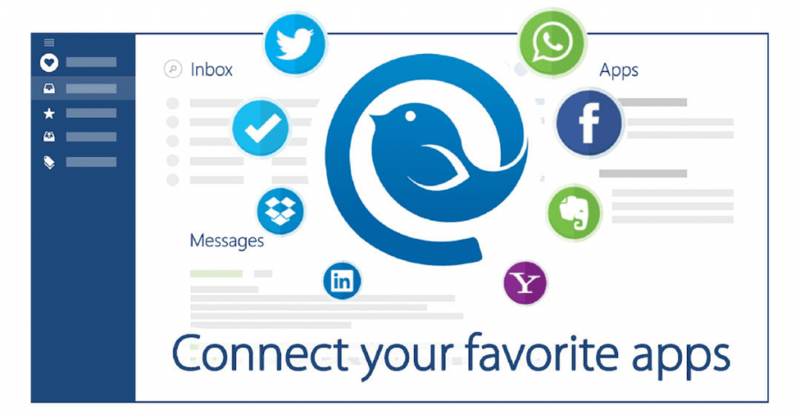 You will receive an email with your personal discount code, that you can use to get Mailbird Lifetime for only $24.50! The sign up page will close July 29th, so sign up for it as soon as you can. 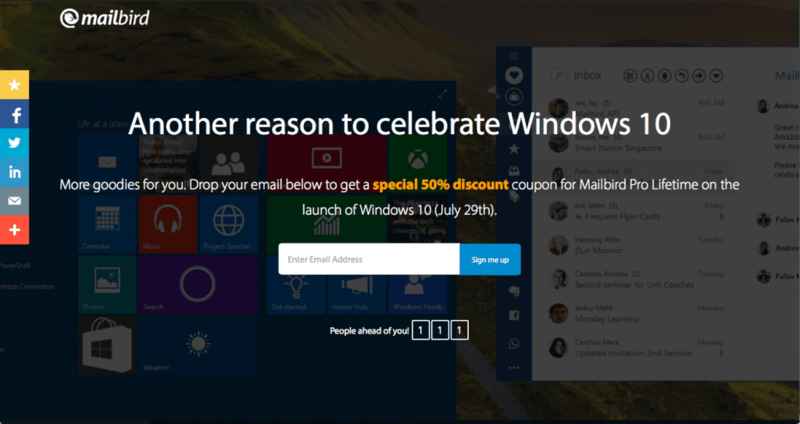 Give everyone the chance to celebrate the upcoming Windows 10 launch with your favourite email client, by sharing the promotion. Thanks for your support, it does mean a lot to everyone of us at Mailbird! 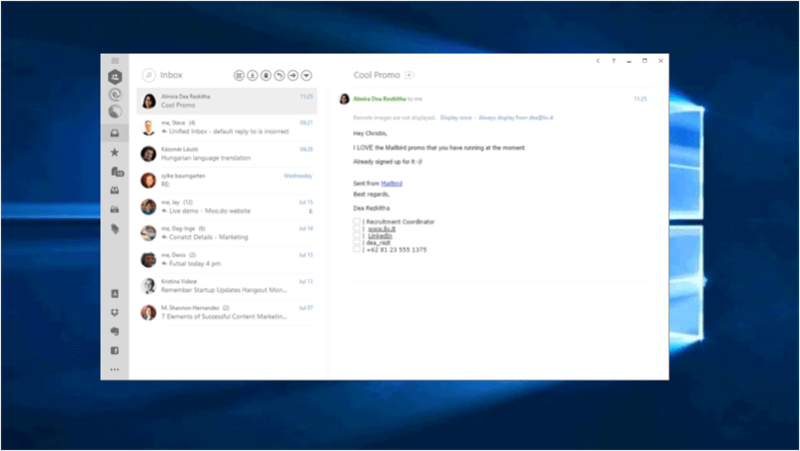 9 thoughts on "Mailbird is celebrating the Windows 10 launch"
Hi there, I would love if mailbird supported the new notification centre which debuts on Win10. It would also be great if we could get rid of mailbird’s tray icon, which is unnecessary if you have app’s icon pinned to taskbar (or at least make it optional). Hey Martin, thanks for your feedback and suggestions. We will def look into that and see what the best option is. Have a wonderful week and thanks for your support. What about the tray icon? I can’t find the setting. I hate this tray icon. No no no, you are confusing the tray icon with the start tab / whatever program tab. damn I can’t even get windows 10 yet and the sale is over. Bummer. Guess i’ll continue being a free member. Hey Brandon, thanks for your awesome support. Please send me an email to [email protected] and I will see that we can still set you up with a discount code;-) Make sure you write me asap as the codes will expire on Wednesday. Have a great day and talk soon.